As mentioned in the previous post November seems to be a month that we just have to go through in order to get to December and the holiday season. To the embodiment of consumerism; the competition over who buys the most expensive and shiny gifts. Our Christmas celebrations were very easy-going. We celebrated Christmas Eve with giving each other gifts, eating good food, playing games (yes, I won) and drinking glögg. My family and one of my uncles. The Swedish word for Christmas is Jul and do thus not denote the birth of Christ what so ever. Because this holiday is not about the birth of Jesus as such, it is not a Christian holiday. Of course the birth of Jesus, the shining star over Bethlehem and the wise men’s gifts can be perceived to be just another way to celebrate the ancient Yule festivities; where the light (Jesus?) is born again, that brings hope and new beginnings in the dark times of midwinter . 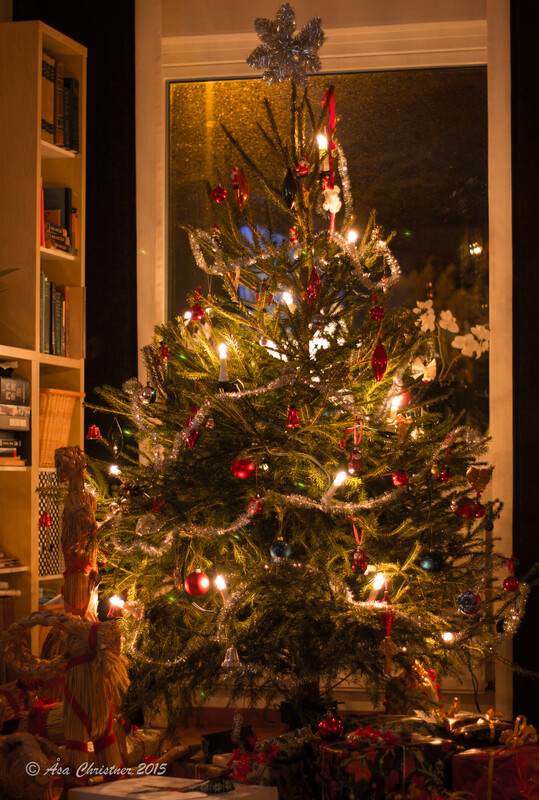 Hence, even if Jesus (and even more the extensive consumerism) is today a given part of the Swedish Christmas celebrations the word for Christmas in Swedish, and many other Nordic languages reflect back to the celebrations of Yule. The Christmas tree, the candles, the colours, the Yulegoat (Julbocken) and the man who comes with gifts all dates back long before Christianity… Our big holidays (Jul, Easter, Midsummer etc) is about manifesting our relation to a power much bigger than ourselves, about our interconnectedness to the nature and each other. 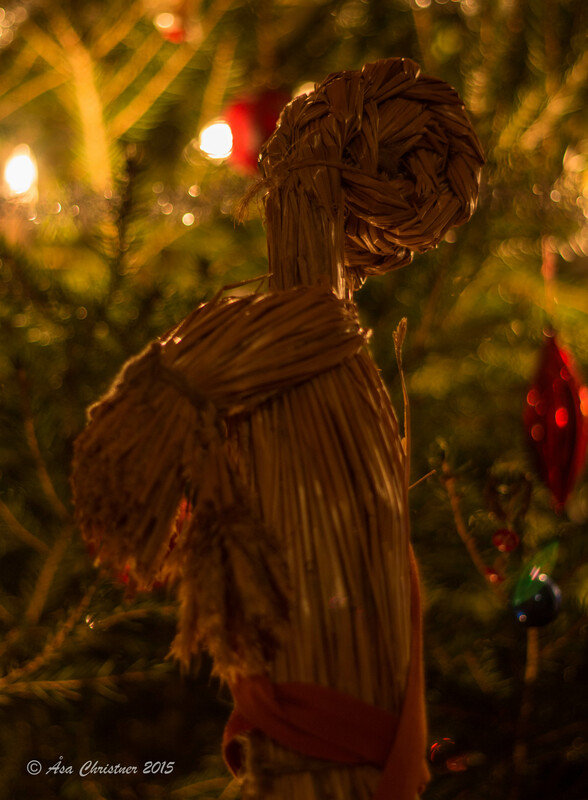 The Yule Goat is made of straw and you are almost guaranteed to find one or two (we have three) under the Christmas tree (Julgranen). Originally the goat symbolise the worship of Tor, the Norse God and was the traditional gift giver in Yuletider, but today it mainly serve as a Christmas ornament. Traditional Swedish “tomtar”, not so much alike Santa Claus as we know him today. 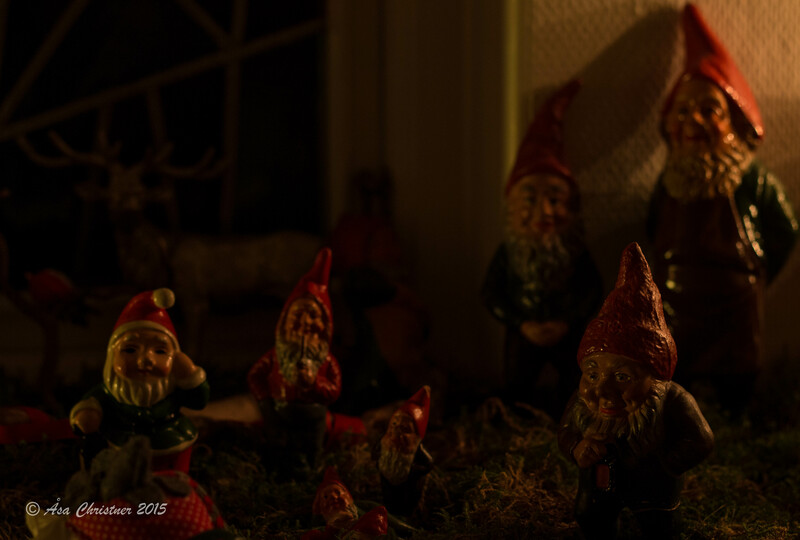 A tomte is a mythological creature from Swedish folklore, a spiritual energy that took care of the homestead when the family was not at home (click for bigger pictures). The winter solstice, the longest night and the shortest day of the year occurred on the he 21th of December this year and this is what we celebrate even if we know it or not. Yule-Jul does have another meaning to, it means wheel (in Swedish; hjul), thus at the winter solstice the wheel start to spin again, away from the dark and toward the light, the sun is coming back. The goddess mother gives birth to the sun king and the energies start once again to burn again. 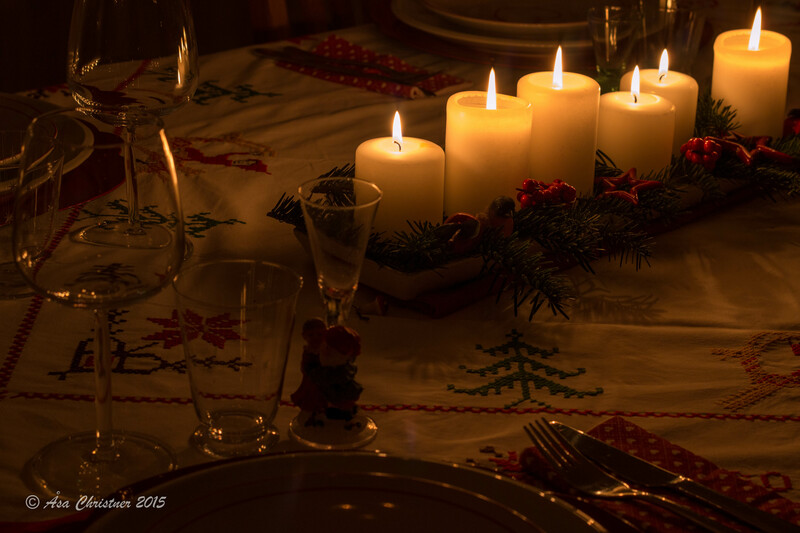 Hence, the time before Jul is a time of stillness, contemplation and inward travel. We have to create our own light and warmth in the dark before we are able to realise the energy of the inward work when the sun is born again. Without really thinking about it, I have spent the whole of December, actually to the exact date of the 21th together with people that I love. I have had old friends visiting me in Sweden, I have been visiting others and I spent the last two weeks up to the 21th together with my special one in Denmark and Germany. Leaving your normal context behind and go somewhere else always makes me think and reflect a bit extra over life. On on the 21th when I was on the airplane back to Sweden I could sense a change of energies that lasted until the very beginning of the 24th of December. The inward work have been done for this solstice. It have not been 100% pleasant but well worth it. I have done my meditation and contemplation for the last couple of weeks and it was settled last night with lighting a candle on my altar, burning some incense and meditation. The coming days will be used to manifest my goals and aspirations for 2016. We are moving forward again, even if we recognise it or not.